While driving during the night, David Fox (Luke Wilson) leaves the interstate and takes a shortcut through a lonely road. He is in a divorce process with his wife Amy (Kate Beckinsale), who is sleeping in the car, after the loss of their son Charlie. In order to avoid hitting a raccoon, David breaks down the fan of his car and the couple finds stranded in the road. Without any other alternative, they decide to spend the night in a nasty low budget motel in the middle of nowhere. While watching some amateurish slash movies in the VCR, David realizes that they have been shot in their room. Sooner they discover that they are trapped in the place and surrounded by sadistic filmmakers of snuff movies. 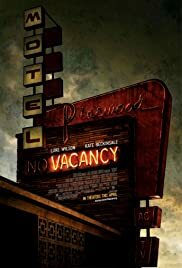 "Vacancy" has a promising and claustrophobic beginning, with the scared couple stranded in a lonely place with a weird manager of an awful motel and listening to aggressive beats in the doors of their room. The development is also tense and good. However, the corny and commercial conclusion like in a television film spoils the story. My vote is six.